December « 2015 « Geekorner-Geekulture. This was quite the episode, and not entirely what I expected this to be. I was all but certain that we’d see why Jirou left the Bureau. Well, we knew from the get-go, to defend superhumans and because the Bureau doesn’t allow him to do that according to his beliefs, and episode 9 showed us that they didn’t part on bad terms, but this episode didn’t really show us a reason, within the show. Nor did it show us where the two sides became enemies, or even when Superhumans became so detested by the common population. The preview, furthermore, makes it clear we’re not going to simply jump ahead to after this whole thing, but that time-skipping, at least to a degree, is going to continue. So, this was interesting, and curious. Before we delve into the thematic breakdown, a few shorter points/asides: The V for Vendetta moment was interesting, and it’s also interesting because it stood for anti-fascism and anti-Cold War and suppression of information, both of which hover in the background of the show, as it deals with late 1960s’ anti-war movement, wars that were fueled by the Cold War. Another point is, man, Jirou and Equus really went all EVA Unit 01, didn’t they? And then the scientist creator-father wondering if his child-creation hates him. In a way, children are always Frankenstein’s Monsters, part your creation, part someone else’s, and part luck and the environment. 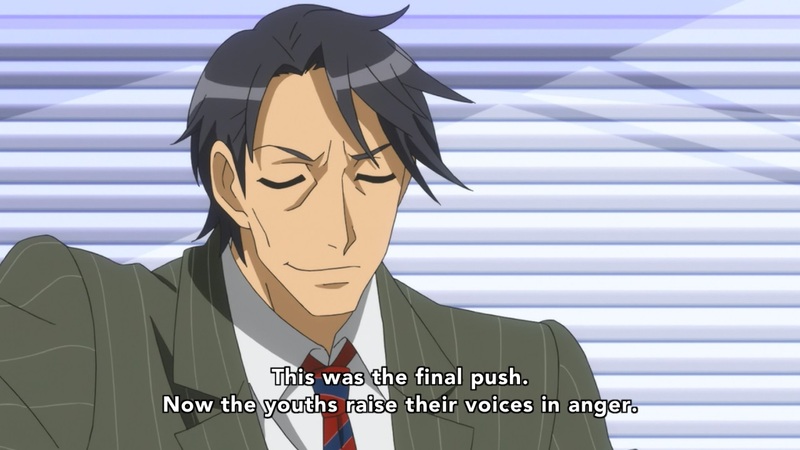 The generational rift is a common theme in anime, and not just that aimed at younger people – it was a main theme in Shinsekai Yori too, for instance. Well, final finally: Bad news, seems timeline updates will still be necessary in cour 2. Good news, you’ve got me. Subtitle: Shiki and the Horror of Happy Homes. Shiki is a show I’m reviewing for the Reverse Thieves Secret Santa project, and fittingly, there’s a celebration within the show that makes for a good place to start this piece, a holiday, which also ties in to the winter holidays of two Abrahamic religions, Judaism and Christianity. Channukah comes at the height of Winter, and one of the miracles it celebrates is that a small container of oil held for 8 days. Holidays held at Winter’s darkest which call forth the Spring are not rare, and the Christmas custom of cutting a sprig of mistletoe is believed to be a remnant of such a pagan holiday. Furthermore, the birth of a “God” as Christianity holds Christmas to be, in the Winter, when it seems the year and the world have died, fit into the same sort of pattern. Although it is held during an especially harsh summer in Sotoba village, Shiki’s end-of-series “jubilee” fits quite nicely. Two weeks before Winter 2016 begins, which is a bit early for me, but it’s time to look towards the new season, and put behind us a season where there was very little of interest, and even then, several of shows I found to be of interest failed me as the season went on. This Winter is going to have 19 fewer newly airing shows than this past Fall season, so will it be our salvation? Read on to find out! As always, in these posts I cover shows I plan to follow, or have thoughts on why I will not follow them, or considered following and decided not to. As always, I try to strike a balance between giving you enough information on the show, and telling you why I think it is or isn’t worth watching. Shows ordered by day, and by expectation within the day, as that affects pick status. The “Almost In” category describes shows that I’d pick up in prior seasons, but decided to put aside in order to make more time for backlog, after growing unhappy with how many of the shows I pick up ending up “not worth the time”, let alone “good”. Much space is given to the people involved with a show, as premises are easy, but execution is hard, and it’s people who are in charge of that. 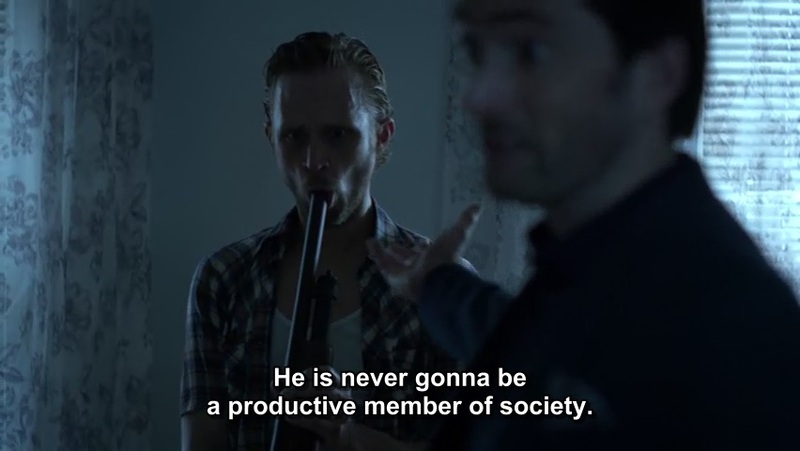 You’re likelier to end up with good shows that way. Most of the information about the shows can be had from the helpful Neregate Chart. Since neither The Cart Driver nor Random Curiosity have their posts up yet, and since I was much more thorough with my research this time around, this is the most comprehensive overview of the upcoming season online right now. Have fun! 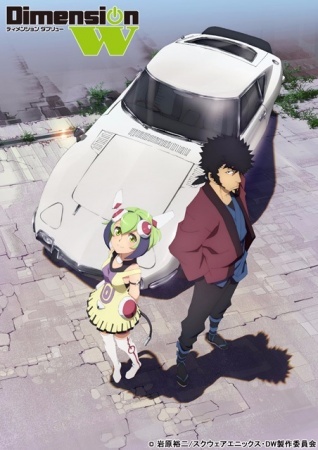 Dimension W – Poor Director Kamei Kanta, after directing Usagi Drop he went on to direct OreShura, Nanana’s Buried Treasure, and Saekano, the last of which I really hated. But even as I hated it, it was very well-directed, just directed on all the things I didn’t care for. Now though, he is joined by Suga Shoutarou, Series Composer for OreGairu (both seasons), Uchouten Kazoku, The Seven Deadly Sins, and Isshuukan Friends. I’d be willing to watch most stuff those two cook up together, but a gritty action-filled criminal-hunting, with some deeper musings on the side? Sign me right up. 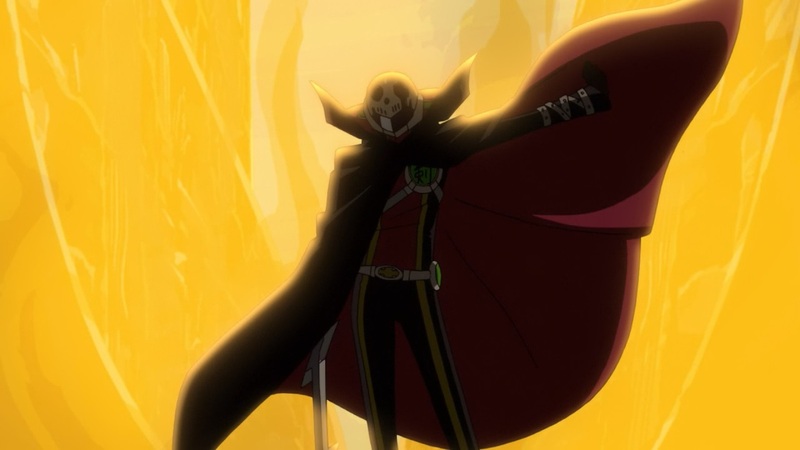 The lead reminds me of a cross between Lupin and Samurai Champloo’s Mugen. This show could be fun, and this show could be great. It might even be both. The mangaka, Iwahara Yuji, wrote King of Thorn, as well. Promising. Interest Rating: 2.5/3. I just hope “cyborg ally, might actually discuss deeper issues,” won’t turn into another Plastic Memories, or Tokyo ESP, that just flopped. But there are good people here. Airing Date: January 10th. Preview. A topic that I sometimes bring up when people discuss how certain characters in the latest novel adaptation to anime isn’t fleshed out sufficiently is that they’re not supposed to be fleshed out, because they’re a supporting character, only there to help the main character’s fleshing out as they interact with them. In most novels, it’s very clear who the protagonist is, and it’s often clear that other characters not only aren’t protagonists, but they might not even be main characters at all. In anime, these novels, and often manga (where ensemble casts are slightly more common), get posed as stories with a handful of main characters, often between three and five (three is a particularly common number for romantic series), but let’s take a look at Sound! Euphonium (Hibike! 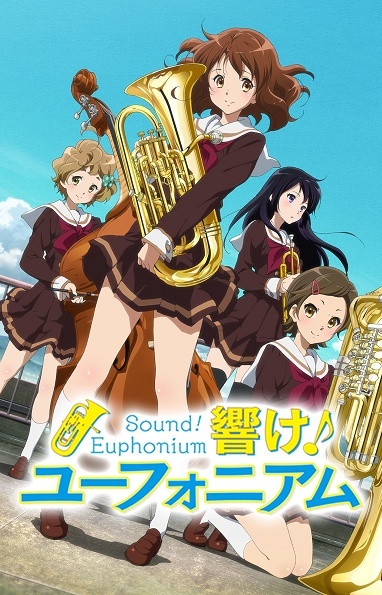 Euphonium in Japanese), where if we go by popular site MyAnimeList (MAL), then we have four, and those are also the first four appearing on the Wikipedia page for the show. All is content added by private individuals, but considering these four appear on the anime’s poster (and are four of the five characters appearing on the first novel’s cover as well), we could go by that. Japan has a long history of conquest and subjugation, even in the 20th century. Even movies such as Grave of the Fireflies and The Wind Rises, here on this subreddit, for a while, couldn’t be had without it being brought up, and how dare they speak of their own plight and not the people they did things to during WW2, say. And not only that, my focus here is on the question of xenophobia, which to a degree might have to do with Japan’s island status, but it’s certainly something that exists. So I wasn’t too crazy about the twist on the “Mutants aren’t real humans!” we’re used to from X-Men, to where supposedly superhumans are fine, and even good, but only so long as they are “evolved humans,” and not “true aliens.” Japan doesn’t need more excuses to avoid discussing xenophobia in its media. Of course, it was a load of rubbish, since the person saying that also pushed for a Kaiju wave, and they’re not humans, and tried to stop regular humans from becoming superhumans with the chocolate scheme in episode 6, but I still didn’t care for the idea that was brought up. Shitposting, it’s hard to define, and we shrug it off by “You’ll know it when you see it,” a form of communication that is becoming inescapable around message boards, Twitter, and chat-rooms. It’s basically memes responding to memes, which have been fermented in the noxious gases of Twitch chat. But are they a form of communication? Are they a form of humor? What are they there for, and how are they misused? I’ll admit, I’m not a fan of shitposting and memes, and never have been, so I’ve spent quite some time from my perch, looking at everyone running amuck in the communities I frequent, trying to understand why people do it, and what purpose it serves. Well, as Hajime of Gatchaman Crowds had so aptly put it, people won’t stop doing what they’re doing if they’re having fun, but there must be some specific need this addresses, and that’s what I’m going to think over, and also how it’s being co-opted by outside forces. Still catching up. November and December will be together. Still have games and anime to catch up on, aside from anime films, which are here. Quite a few films, more than I thought I watched, and I didn’t care too much for most, but I did for a few, so let’s go through it. 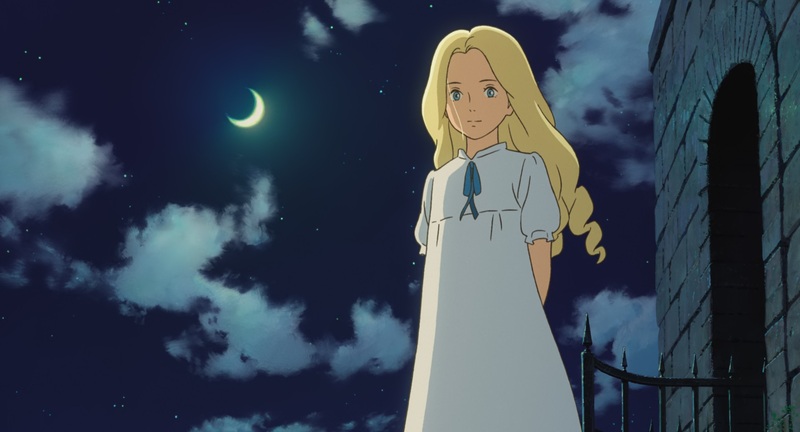 When Marnie Was There + Rewatch – Yes, I actually watched it twice during this time period, once in May, and again in November. This is my 2nd favourite Studio Ghibli film from the last two decades (accounting for the fact I haven’t watched a couple of the Takahata films), with the favourite one being Princess Mononoke. This is a perfect capstone for Studio Ghibli, or at least to the Miyazaki style of movie-making. It’s small and heart-felt and magical. I wrote a bigger editorial about it that is heavily spoilerific, but I strongly recommend this film to anyone and everyone, of every age. I do recommend the sub strongly here – the dub acting is fine, but it completely changes the nature of the thing. 9/10.